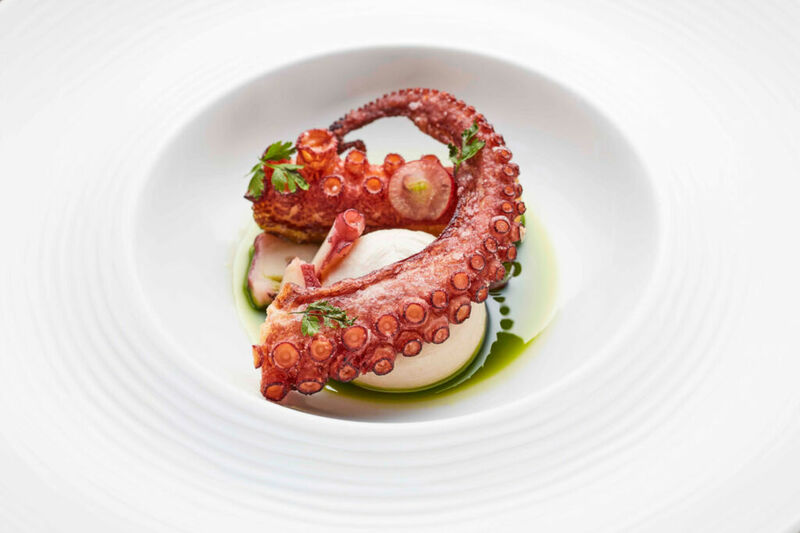 Simon Wittenberg visits the Michelin-starred eatery for dinner on Halloween, a haven for fish and seafood lovers. There are no fast tricks pulled at Outlaw’s, and treats for the palate are in abundance which start from the moment that you walk in. Sitting within the five-star Capital Hotel on Basil Street in Knightsbridge, a stone’s throw away from Harrods, the restaurant, which is run by Michelin-starred Executive Chef, Nathan Outlaw, and led by Head Chef, Andrew Sawyer, prides itself on sourcing the very freshest produce from Cornish day boat fishermen, or “hook to plate” within 24 hours. This is an impressive feat, considering the sizeable distance that lies between the south western county and London. Before being shown to our table, we were invited to recline on the dark green leather banquettes in the colourfully-lit hotel bar for a pre-dinner tipple. With a bowl of spiced nuts to hand, we perused the menu which is centered around this establishment’s two favourite ingredients, gin and Vermouth (a wine that has been infused with botanicals and aromatised with brandy), but they are nevertheless more than happy to conjure up your preferred cocktail if it’s not listed. Being a long-term fan of Piña Colada, I headed for the “Capital Punch” (£13.50), a cleverly concocted blend of rum, vanilla syrup, Vermouth del Professore from Rome, lemon juice, pineapple and coconut tea, all topped with a pineapple crisp which sat on the large square ice cube suspended in the glass. All I can say is that it didn’t last very long, and proved an effective way to moisten the palate. My guest chose the equally flavoursome Vermouth-based “Bloom and It” (also £13.50), which had a subtle Campari-esque taste about it. 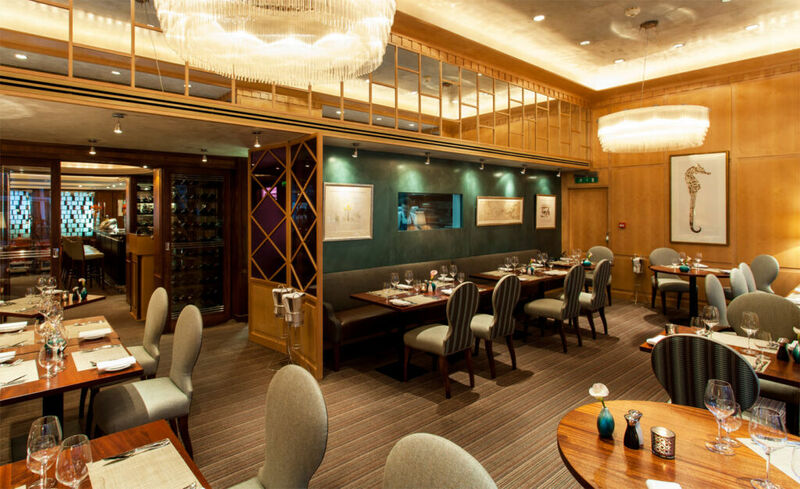 The décor of this 36-cover and intimate restaurant is classic, but yet chic, and is pertinently themed around the sea. There’s a large picture of a seahorse at either end, and furnishings take the form of striped chairs, dark wooden tables, and two large circular chandeliers. Our spot for the evening was next to the window, which allowed a good view of both what was happening on the street, and of the kitchen which is semi-open, so you can catch a glimpse of the surprisingly calm chefs at work. 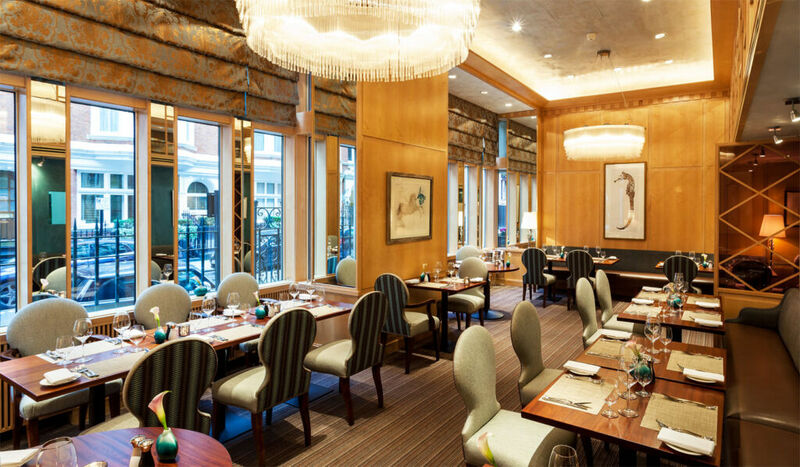 Diners have the choice of the Signature à la carte (costing £55 and £69 per person for two and three courses respectively), or a five-course tasting menu (costing £95 per person without a matching wine flight). We opted for the former, which has around six to seven options per chapter. 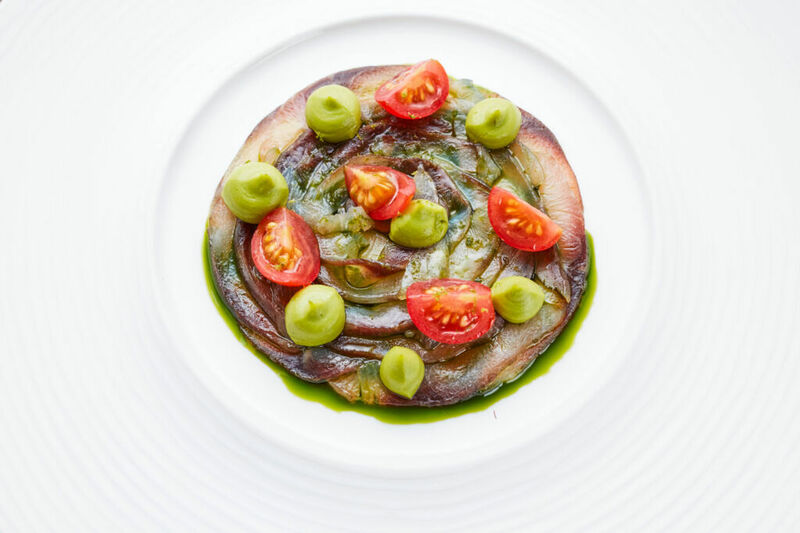 If visiting with someone who is not so keen on gastronomy that originates from things that swim, there are some alternatives, such as a duck scrumpet and goats cheese tart for the opening course, and côte de boeuf and Burrata for the mains. However, our raison d’être was to sample Outlaw’s exquisite range of fish delicacies, and that definitely proved to be the right decision. 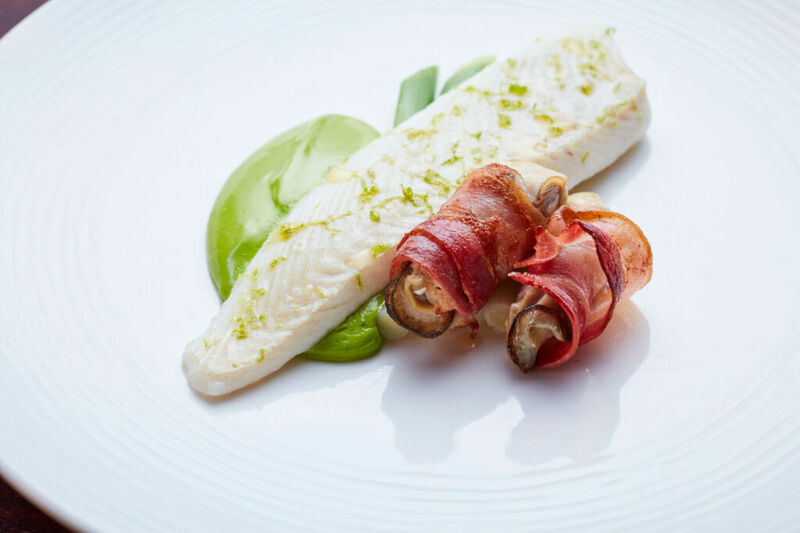 Dietary requirements are very well catered for from the off, whether it’s because of an allergy or a dislike, and dishes can, therefore, be modified, where possible, to suit individual preferences. Following a red pepper and cheese scone amuse-bouche, and some fresh white focaccia and brown sourdough bread to whet the appetite, I chose the creamy parsnip soup for my opening round which swirled around a piece of smoked hake. The slight kick to it came courtesy of the pickled apple and curry oil. My dining partner was drawn to the London-cured smoked salmon which came with a delightful cucumber chutney and a spoonful of horseradish yoghurt. It was smooth, full of flavour and can only be described as a “melt in the mouth” experience. If you don’t fancy a traditional starter, then you can always go for the Porthilly Rock oysters (£30 for six) instead. 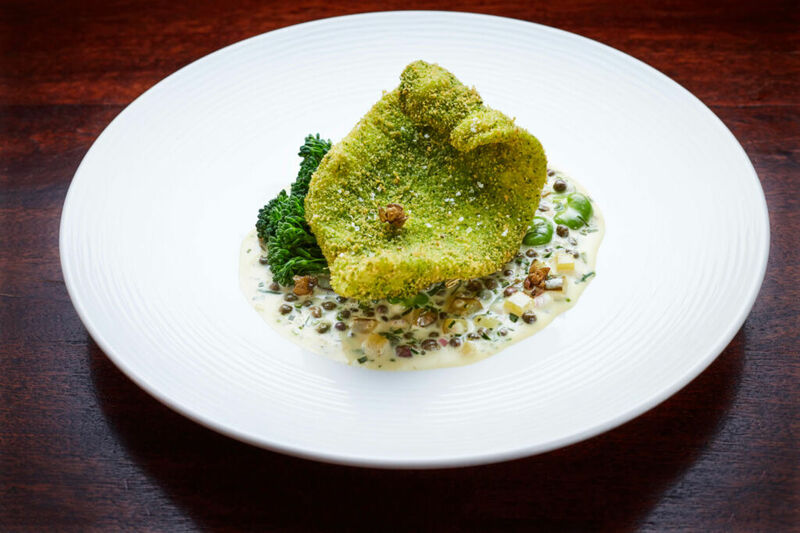 A breaded goujon, which was carefully balanced on a moist piece of plaice, which was itself perched on al dente purple sprouting broccoli and warm tartare sauce, were the key ingredients of my main course. With the fish being so fresh, you could almost still smell and taste the waters in which it originated, and it was one of the best dishes of its kind that I have tried. Complements to the chef were truly deserved for this one. 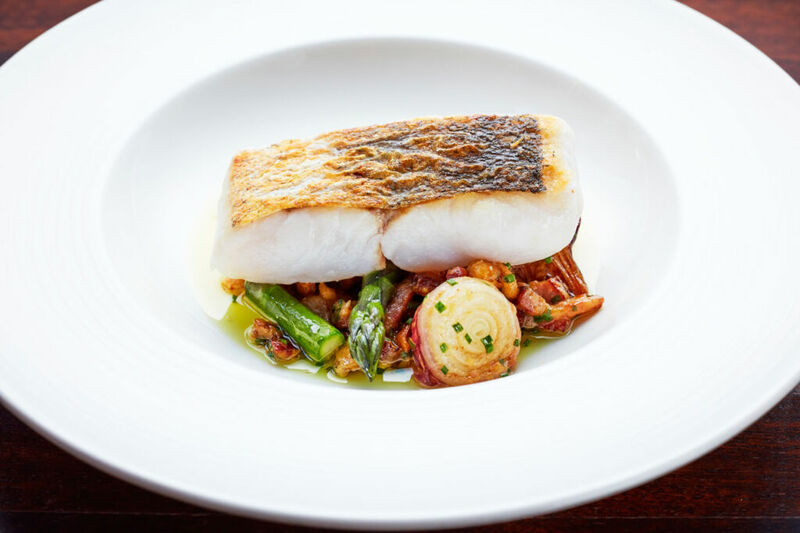 My guest was equally full of praise for her slightly browned piece of hake which was presented in a bowl with celeriac and an addictive and generous portion of clotted cream sauce. Sides are £6 each at Outlaw’s, and we accompanied our meals with a helping of Cornish new potatoes with seaweed and garlic butter, and the grilled Hispi cabbage cooked with preserved herrings, hazelnuts and a mustard dressing. A comprehensive wine list is also on offer, and we decided on a glass of the white and citrusy 2016 Grolleau Gris, Domaine du Haut Bourg from the Loire (£7) to go with the plaice, and a 2014 glass of white Cornish Darnibole Bacchus, Camel Valley (priced at £10 per glass) to go with the hake. Perfect. Dessert combines sweet and savoury (namely a cheese plate with pickled celery, chutney and crackers), and it was the profiteroles with a crisp amaretto outer crust and an almond interior that was to be my closing chapter. Decorated with a thick dark chocolate sauce, this sweet turned out to be extremely filling, and I was defeated after finishing the second of the three profiteroles, so much so, that I had to resist tucking into the very appealing petit fours. For my guest, it was the clotted cream sandwich with fig halves and a tangy apple cider sorbet that ended what, for her, had been an equally excellent meal. It’s clear to see that the hospitality provided by the team has been well honed at Outlaw’s, with our hostess explaining that the staff see themselves as a family and socialise together. That special bond clearly shone through in what was an exemplary standard of service throughout, friendly and attentive, but yet not intrusive. Outlaw’s at The Capital has undoubtedly mastered the recipe for success, as well as the laws governing how to do great cuisine. Nathan Outlaw has cleverly brought Cornwall to London, and a literally fresh philosophy has paid dividends. So, like me, if you’re a lover of anything marine, it’s definitely the place to be. Outlaw’s at The Capital – Where and How? Outlaw’s At The Capital is located at 22-24 Basil Street, London SW3 1AT, United Kingdom. 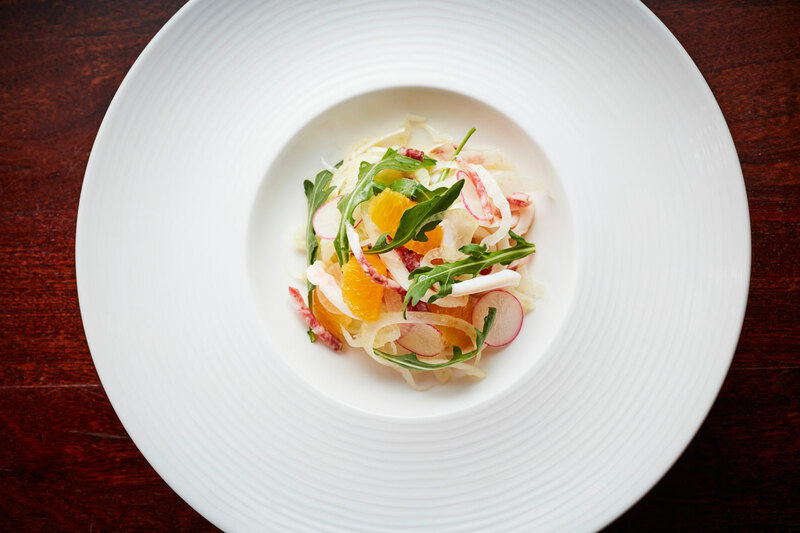 For more information, or to make a reservation, visit www.capitalhotel.co.uk/dining or call 0207 589 5171.